The core of Jay Sugarman, Earnie Stewart, and Jim Curtin’s vision for their beleaguered franchise on the banks of the Delaware River is the Union Academy. Young players — cheap players — would rise up through the ranks, earn their way onto Bethlehem Steel and then the Union, and finally become stars in Major League Soccer and the U.S. National Team. That’s not a bad plan. Really, it’s not. But it requires a couple of things that may be absent. For one, it requires patience. Like Rome, a pipeline of young talent isn’t built in a day. Union fans, rightfully, aren’t patient about a team that keeps giving them more and more of the same gruel-dyed blue and gold with only the promise of a better future to neutralize the taste. More importantly, though, this plan requires an actual commitment to young players. That means surrounding young players with a coaching staff that trusts them, that is able to pull out their best performances, and that pushes them to improve day after day. Right now, that commitment is severely lacking. Optimism about the future was high after 2016. The Union had a banner draft class that contributed mightily to an unlikely run into the playoffs. Keegan Rosenberry… well, everyone reading this knows the story. Runner-up Rookie of the Year last year, Rosenberry started out of form, lost his starting spot, and has been chained to the bench ever since. He hasn’t inspired confidence in his appearances, but he’s also not getting any opportunities at Bethlehem Steel to work out the kinks. Josh Yaro began the year with a nasty shoulder injury. Then he found himself in a battle with Oguchi Onyewu for a starting spot — a battle he lost. 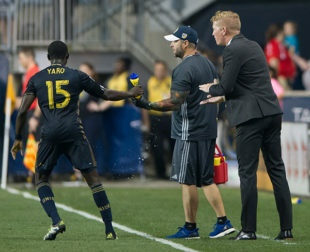 Yaro saw his first action thrown into the fire against NYCFC, didn’t start again for two months, and then made catastrophic errors each of his last three starts. At one point in August, Curtin said that Yaro “was in week 3 or 4 of preseason.” This was two months after his first start of the season, and over three months after he returned to practice. Fabian Herbers earned praise throughout camp from his manager — often unprompted — as the player who looked the sharpest. And yet it didn’t take long for him to slide into a reserve role, making just four starts against twelve appearances with Fafa Picault, Ilsinho, and Chris Pontius preferred to him. Two injuries later and Herbers is looking at a wasted season. Derrick Jones began the season as a surprise starter, showing off a destroyer’s mindset and a well-rounded skillset in defensive midfield. But once Alejandro Bedoya returned to the No. 8, Jones hit a wall. He saw straight red against Red Bulls at home, then earned his manager’s ire as the team crashed out of the Open Cup to the same Red Bulls side. Right now, Jones isn’t making the gameday 18, though he is getting time with Steel. Auston Trusty hasn’t even sniffed the senior team this season. This is due, in part, to a log jam at center back, but it’s worrisome nonetheless that he’s been used at left back by Bethlehem Steel. More devoted watchers of Steel than I will have to assess his performances down on the farm. Richie Marquez is right on the edge of “young player,” but it’s disheartening to think that he’s now less than an afterthought after being an every-minute player for nearly two full years. Then he suffered a nasty illness that knocked him from the starting lineup, made one substitute appearance against NYC FC, and hasn’t been seen since. Ken Tribbett now plays regularly for Bethlehem Steel and extremely irregularly for the Philadelphia Union, which is how it should be. Eric Ayuk, on loan, has scored one goal in ten substitute appearances for Jönköpings Södra IF. The winger, who played 1,320 minutes in his age-18 season for Philadelphia, has earned just 246 first-team minutes since. John McCarthy, entering his third season with the Union, has been a bright spot with Andre Blake sidelined throughout the summer. He’s demonstrated strong shot-stopping abilities and eliminated silly mistakes, showing that he is a capable backup in Major League Soccer. What can we glean from this list? Aside from John McCarthy, every young player on the Union has regressed in 2017. Now, some of this regression is undeniably due to circumstance. Injuries and illness have been a real problem for certain players. Others may have been played above their level to begin with (which is a related issue that I’ll put to the side for now). But certain habits of the coaching staff have exacerbated the situation. Jim Curtin doesn’t like to make changes when the team wins. He doesn’t really like to make changes when the team loses, either. Rarely does he make a switch for tactical reasons, or when a veteran player is clearly out of form. The staff are also timid. They seek only one point on the road, constantly playing up the perils of travel in MLS. They prefer to seek clean sheets, rather than scoring two or three goals. This leads to a bias towards experienced defenders like Oguchi Onyewu and Ray Gaddis, solid performers who offer nothing for your franchise’s future. These have made it hard for young players to earn the coaching staff’s trust, even harder for them to keep it, and harder still to win it back after losing it. You can, of course, point to a couple of bright spots — the young players who joined the roster this offseason. Giliano Wijnaldum finally ended Fabinho’s reign of terror at left back. Marcus Epps earned minutes on the wing. Jack Elliott exceeded all expectations and is a leading Rookie of the Year contender. But why should Union fans get excited about these players when their futures are so fragile? If Jack Elliott starts next season on a poor run of form, he may find himself in the wasteland with Richie Marquez and Keegan Rosenberry — all while the team hypes up the performances of Bobby Sixth-Round-Pick and Johnny Veteran-Signing. Building a strong academy is a vital part of modern football, especially for clubs with limited resources. Patience, too, is necessary. Developing young players is an imperfect art, and few people have all the answers. But to ask your fans for that patience, you should be able to show “proof of concept” — that you have young players who are getting better every year, and are destined for stardom. Right now, that proof of concept is lacking. If what happened to Keegan Rosenberry this year is the norm, why should Union fans trust this coaching staff with Anthony Fontana? The next person who can explain to me how Philadelphia is a soccer hotbed to such a degree that there should be a reliance on the Academy as a way forward will be the first. I love Philly but this ain’t exactly SoCal, Texas or even NYC. Is Black Swan a #10? I’ve never heard of him. Because the tri-state area IS a soccer hotbed? Just because the Philly MLS team has a dumb coach and a bad track record so far doesn’t change that fact. Owner that doesn’t want to spend (Sugarman) – 1st team. It’s really that simple. Sugarman is unwillingly to invest b/c he has been told Graham’s investments will fill his pockets. Pulisic and Canouse are both from the cachment area. Zak Steffen is an academy alum. Isiah Young is now with Werder Bremen. Porto poached an academy keeper. Sebastian Elney was a freshman all-american and is the starting 9 for a program that has championship ambitions. Add in Rosenberry and the current homegrowns, you could field a hell of a U23 team. What Curtin did to Rosenberry is criminal. what? Benched him because he sucked? Rosenberry paid for the roster chaos that was the beginning of the season. He was set up with Gooch (who started out as bad as the rest of the team) behind him, and Ilsinho in front of him. The shape of the players around Keegen left him isolated and stranded over an over, whether it was when he moved up the wing and nobody covered his space, or when the other team would come bombing down the side line and Ilsinho would be standing at half field looking back. He was best when paired with Yaro in the back, but apparently Curtin has forgotten about that already. Honestly, putting Keegan back in right now might help both of them. Is Keegan hoping to play with Yaro his entire career? How did Keegan do paired with Yaro last Saturday night? Its hard to find exampes to not disprove this. But Hey Edu played 30 minutes, so we have another center back #6 #8 type. maybe he’s the answer for our missing #10? Rosenberry showed himself to be a good offensive player but teams started to figure out how to attack him as the season went on. He now appears to have developed Andrew Wenger disease, where he has lost all confidence and his skill has disappeared along with it. It’s already probably time for a change of scenery for him, but if he can’t learn how to tackle the ball from an MLS-quality winger, he probably just wasn’t that good to begin with. Yaro has never been good, and quite frankly, I’m not sure what people see in him. Physically, he’s got the tools, but mentally, he’s nowhere near MLS quality. As a defender, that’s unacceptable. I don’t see much of a future with him, because I don’t think it’s a coaching thing, I think he just doesn’t process the game fast enough. Maybe that comes with time, but he’s got a long way to go. Herbers’ biggest problem, much like Bedoya, is that he needs better teammates around him to really thrive. As the team has regressed, he has regressed with it. Not sure that’s fixable – when you are good at interplay with others, you need others to interplay with. Jones actually graded out really poorly when he played earlier this season, and his sporadic appearances have only confirmed that he’s just not MLS ready yet. At 20 years old, he’s probably still 2-3 years away from being MLS ready. I know nothing about Trusty. Marquez has one fatal flaw – he positions himself in such a way that attackers can cut across his face too easily. This is an easily fixable flaw with proper coaching, as it’s just a minor technique/positioning change. With a former defender as coach, you would think this to be fixed by now, so maybe Marquez just isn’t taking to it, but he should definitely be playing over Gooch regardless. Tribbett was never good and quite frankly it’s baffling why he’s still on the roster. Ayuk needs to show that he bring something more than Epps, but he’s also only 20 and still probably needs 2-3 years. More importantly, I think what this shows is that building through the academy and draft, as a whole, is a poor strategy. There’s way more volatility with young players, and you need to have a high quality coach, high quality players, a ton of patience, and an acceptance that most players will fail. Going back to the start of this now-too-long comment, there’s a reason most top prospects flame out. Weaknesses are found and the player is unable to fix them. Injuries sap effectiveness. The player just wasn’t actually that good to begin with. Projecting prospects is an inexact science. I spend a lot of time every year projecting NBA prospects. My mantra is “if you want the highest possible accuracy, project everybody to fail”. Most prospects in every sport fail. It is the nature of things. I have probably been the most vocal anti-Stewart, anti-Academy person here, constantly pointing out that this is a really bad strategy. It’s a really bad strategy. It’s good to fill out your roster with 10 young guys making the minimum or a little above that, with the hope that 1 or 2 develop into a quality starter. But there’s no such thing as “building through the academy”. It’s a fool’s errand. Especially because, unlike in the other American sports, if you actually do develop a good player, they are bolting as soon as possible (like Michael Farfan, and as of this offseason, probably Andre Blake) unless you give them a major raise, at which point you’re still not really saving any money and may as well go buy good players to begin with. Every time somebody in the Union organization asks for “patience” or says “we’re building through the academy”, call them out on it. It’s not a viable or legitimate strategy. It’s a blindfold. Don’t be blindfolded. Take it off and make your voice heard. If it’s a bad strategy to build through the academy, why are Dallas, Red Bull, SJ, et al. going that route as well? And how are so many European teams able to do it successfully? If the majority of prospects fail, that doesn’t make it a bad strategy. It just means you have to give chances to more prospects. And ideally, the team should make enough money off the players that leave to find a replacement if they don’t have one already in the pipeline. So I’m genuinely curious why you think the strategy isn’t viable. There are ample documentaries that have shown that most Academies at European Clubs have been a complete failure. Most kids drop out, and very very few are sold at a huge profit or make it to the first team. There is absolutely no evidence that the Union will be more successful. Maybe if they had hired a Youth Director from Ajax or from another great Academy then I would think differently. The Union has done a lot towards setting up the Academy and working on it’s homegrown players – more than most MLS teams. This isn’t a strategy that is going to fill out your roster though. If we are extremely lucky the Academy is going to produce maybe 1 or 2 players every couple of years. Right now only two players in the list above could be considered our products. Everyone else comes in from somewhere else. Next is coaching. The kids are only going to reach their potential with good coaching. I admit I know little about our Academy coaches. What I do know is that Curtin is really bad at getting the youngsters to the next level. Consistently bad. I still believe in bringing up the kids and running a true Academy, but currently this is a supplement, not a pipeline and won’t be a pipeline during Ernie’s 5yr contract. I want him to keep pouring resources into the system, but Stewart needs to stop saying that this is going to be our answer for what ails the Union. Academies are not a replacement for scouting. What I really need to hear from Ernie is balanced talk of both. We need to hear him saying that he’s got feelers out not only in his old stomping grounds in Northern Europe, but down in South America and elsewhere as well. This is the Union’s true weakness right now, and until we start investing more in scouting (i.e. hire scouts) the Union are going to be stuck right where it is – out of the playoffs. The club has been talking about this for awhile, yet very little progress. I think I’m going to copy-paste the first quote into my reply to my ticket rep about re-dooping for next year. Here’s the link to the full letter. It’s hilarious and depressing at the same time. Have to agree with a lot of the sentiment here. I don’t believe our coaching is appropriate for the “build from the academy” strategy. There are two specific examples that I look at in MLS, which are Dallas under Oscar Pareja, and NYRB under Jesse Marsch. For Dallas, you have a coach with a long playing career with the team, who understands the rigors of the league, and who immediately transitioned into an assistant coach with that team, a US National Team development coach, and then a head coach for Colorado, and then back to Dallas. In that time, you’ve seen players like Jesse Gonzalez, Victor Ulloa, and Kellyn Acosta come directly out of their academy largely on the efforts of Pareja guiding their strategy. Dallas doesn’t sign big name players either. In NY, you have an organization that risked alienating their already apathetic fan base by firing a popular coach and installing Marsch as head coach because of their belief in a style and a system of development to fit that style. If you look at their kids, Adams, Muyl, Etienne, and Davis, they’re creating success in a different way, where these guys to an extent have been around the JPA’s and Henry’s of the world as they’ve come through, and now have a clear direction of how their team functions in each position on the field. So they’ve both spent money, and largely given opportunities to their young players while keeping a high level. I’m not ignoring the fact that both teams are league originals either, and that the Union has come out of some franchise dysfunction through Nowak and Hackworth and Sak, but I’m wholly unconvinced that Jim Curtin is the guy that is the right head coach for the job, given the anecdotal news we hear about his “style” from Earnie, or the work that he puts in every day on the training ground that has seemingly immunized him from organizational pressure. Curtin needs to be part of the academy and development staff permanently, and they need to install a savvier head coach who can really instill a set system, while being flexible and in tune to player abilities and form. They also need the scouting staff to sign support for the core of three or four guys they’ll get out of the academy at any one time, which should be Earnie’s focus as well. Its going to be a long time before this tree yields edible fruit. This is an excellent article. Everyone who continues to bang their head against the wall with total votes of confidence for Curtin and Stewart, read this article. Maybe it’s not Curtin’s total fault, but he’s getting it from somewhere. Someone has to be accountable. The ticket rep called me the other day and basically offered $800 worth of free things to come back next year. They know there’s trouble. I’m not even picking up the phone. I’m waiting to see what happens this offseason. Specifically who goes and who stays. If tose moves look like they’re actually going to try to do something other than mark time then I’ll consider buysing a few games worth of tickets. Until then, I’m spending my money elsewhere. I have generally been in the camp of saying that making a coaching change is pointless — not because Curtin is such a great coach, but because it generally has less impact than people think. And most often it is simply an excuse for a team that has simply not acquired the appropriate pieces. I don’t think anybody can dispute the fact that the Union have failed to assemble the appropriate pieces to become a truly competitive MLS team. And yet, Peter’s argument: “Jim Curtin doesn’t like to make changes when the team wins. He doesn’t really like to make changes when the team loses, either. Rarely does he make a switch for tactical reasons, or when a veteran player is clearly out of form…The staff are also timid. They seek only one point on the road, constantly playing up the perils of travel in MLS. They prefer to seek clean sheets, rather than scoring two or three goals. This leads to a bias towards experienced defenders like Oguchi Onyewu and Ray Gaddis, solid performers who offer nothing for your franchise’s future. These have made it hard for young players to earn the coaching staff’s trust, even harder for them to keep it, and harder still to win it back after losing it.”… I must say that I find this argument pretty compelling. I am starting to believe that both might be true. If Curtin were fired, the Union would still not be a really competitive team. And yet I wonder if they might be closer to competitive, and if they might plant better seeds for the future. Comments you really should do your homework first! At no point has “kick and run” EVER been pushed at the Union Academy. That’s a ridiculous statement. Great article. Very true about only seeking one point on the road. I’ve never heard Curtain use the word “win” once prior to a road game. And after they lose or draw, it’s always about bad luck or how tough it is to win on the road. Nothing but excuses. Derrick Jones seems to have replaced Ken Tribbett recently with the Steel. I cannot tell whether he is being groomed for the Six or the eight. Certainly his ceiling is higher. Auston Trusty is gaining experience. A few times last Sunday against Louisville he tried things that he newfound have attempt last season and made them work. He is not quite ready to become the lead center back, but he closer,than he was. Not to worry about his being pushed to left back, I suspect. It happened because both Jones and Tribbett came down for the same game and both had to start, which disrupted things. And there was an injury that meant a Rube Goldberg fix was necessary. Marquez may revive himself playing at the USL level. Three years ago he was quite good there. I would suggest recalling Austin Berry’s story., in general. Oh. Fontana played very well against Louisville. Subbing on for Edu.made a clear,difference. With all due respect OSC, didn’t the Union really screw up Berry so badly that he had to go play in South Korea in order to revive his career? But is this Berry’s fault or the Union training staff’s fault? Not snarking, asking for real. nagis – I have no idea what exactly happened with Berry. He just went from a starting centerback to not even making the 18 to being sent out on loan. Very weird. MarkZ – That occurred after Berry had been frozen out of the side. My point still stands that Berry was a young and talented player who came to the Union and saw his career go sideways/backwards. I thought Trusty looked very poor against Louisville. I’ll still take Marquez over Trusty, without question. Good article, Peter. I wish it all wasn’t so true. Curtin’s a nice guy but he’s in over his head. So many players have washed out because of this organization and I genuinely feel bad. Young guys and their egos/confidence are fragile, no matter how hard they may be on the pitch. This club excels in building someone up and then casting off when they falter. I’d rather lose games with creative lineups and innovation than draw games with the same old Union. Wijnaldum is a bright spot ?? I have to disagree on that one. He’s worse than FAbinho right now. He hasn’t been checking back to the ball when in offensive transitions and he has been Benign with an offensive prowess at left back. Philadelphia Union: Where talented youngsters go to die…or at least be retired for soccer in a few years. We are such a dumpster fire.